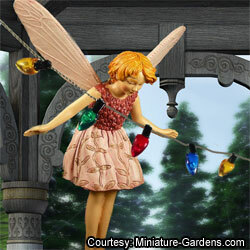 Let the magic of miniature fairy gardens give you the Christmas you’ve always wanted. You can create the garden and entry of your dreams without breaking the bank, redoing your landscaping or remodeling your home! Are you feeling nostalgic for a Victorian Christmas? Create your own Christmas outdoor scene. Start with a shallow container and choose a Victorian house. Then, from our exciting assortment of diminutive plants, miniature pots and small-but-realistic lawn ornaments, create your own holiday front yard, walkway, porch and entrance. Use tiny containers to flank the doors, a decorated dwarf conifer as an outdoor Christmas tree, ribbons over the windows and colored sand or mini-pavers along the pathway. You can even add a decorated doghouse, shed, or teensy wrought iron table under a gazebo. Maybe a white picketed seashore cottage is your dream. Create it in miniature! Add a rustic mailbox, vine twig furniture and a tiny surfboard in the sandy surface and you can almost hear the ocean. Twinkling LED lights add a festive touch, or opt for a tiny palm tree strung with holiday ornaments. Perhaps you’re an apartment dweller, dreaming of having your own veggie garden. Assemble a miniature garden with realistic tiny vegetables, tool shed and tools. Add a wishing well, a wheelbarrow and scarecrow. Put in a chicken coop with tiny chickens. Your friends will be looking for Peter Rabbit! For a winter touch, add a fun snowman to the scene. Maybe you’re not looking for something for yourself. Are you seeking a unique hostess gift? Consider planting a tiny Japanese garden with a moon bridge arching over a pond stocked with koi. A simple miniature garden with a few personalized items your host will love such as a lawn swing, bicycle, or fairy hiding in a small bush is sure to bring a smile to their face. Give the gift of time by constructing a miniature garden with a child or shut-in. A shared miniature garden is an ongoing fun project, and you can rearrange the garden and create new scenes with very visit or for every season. Create a wonderful opportunity to share stories and imaginative fun while fostering a love of gardening. Stocked with a huge assortment of miniature and fairy garden accessories, our gift shop offers everything you need to make your Christmas miniature garden. If you need visual ideas, our bookshelves are stocked with beautifully illustrated books chock full of mini-decorating and gardening ideas. Come on in and get ideas, choose your items and make your Christmas dreams come true.